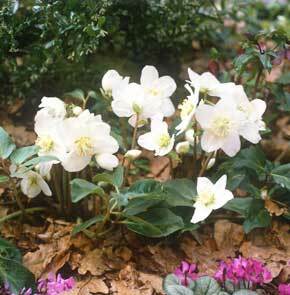 To grow Christmas roses start off by buying cheaper ‘tester’ Helleborus niger in smaller pots. If possible, buy your Christmas roses in flower, looking for rounded blooms and plenty of healthy foliage. Pot them into slightly larger black plastic containers. It’s important to use a free-draining, soil-based compost such as John Innes No3. Place Christmas roses against a warm south-facing wall. Once they’ve finished flowering move your hellebores into a dryish position in semi-shade, but continue watering them once a week so that good-looking foliage is produced. Make sure to deadhead the flowers to keep plants vigorous. To keep Christmas roses lasting, repot your hellebores into slightly larger black plastic pots every year during the second half of summer. When repotting add some slow-release fertiliser – hellebores are hungry plants. Then move them back to the warm wall in late autumn. If you need to divide Christmas roses after a few years, split into two or three large pieces, but generally it’s best to leave well alone. This system also works with later-flowering hybrid hellebores. So get out, and get planting and enjoy these beautiful blooms. Very floriferous, with round, pure-white flowers. Well formed, cup-shaped rounded flowers of purest white on strong stems.